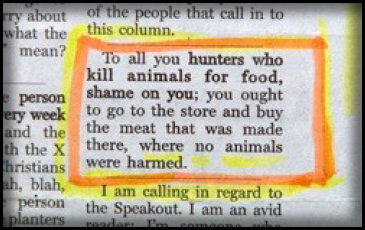 Animal Rights -- NOT ! ! "The old Lakota was wise. He knew that man's heart away from nature becomes hard; he knew the lack of respect for growing, living things soon led to a lack of respect for humans too. So he kept his youth close to its softening influence." Comment from Laurella Desborough in The Des Moines News/SeaTac News/The Highline Times regarding and article they published about a King County raid. Hmmm. Illegal entry into a home? This is okay in this county? People charged with cruelty for keeping old dogs, which DO have health issues, teeth issues...just as us old humans do. Some dog owners like their dogs and prefer NOT to euthanize them just because they are old and have health problems. Charging people with cruelty because dogs have feces in their kennels...well, those dogs must be eating or there would be NO FECES...seems pretty much common sense. And, after feeding, some animals WILL have no food left in their bowls. Is there a law that says food MUST be provided in such an amount that food will be left in the bowl even after the animal was full? That will lead to obese animals. This is likely another case of ...."follow the money" where the confiscating entity is going to end up selling the animals and making income, and additional income on donations. This is now happening across the US. I don't even own a dog ! But, I have seen too much manipulation of these cases in the news...not by the journalists, but by the confiscating agencies and their followers. Very sad. November 16, 2009 HSUS CEO, Wayne Pacelle, made the suggestion: ...every "responsible breeder" is a "puppy miller", every "family farmer" is a "factory farmer" and every "responsible hunter" is a "poacher". This is what HSUS really thinks about anyone involved with animals! Don't donate and don't believe them when HSUS says they protect animals. Appeasement of the animal rightists will not work. NOTHING will ever be 'good enough' and the more we 'come to the middle' the more the middle shifts in their direction. because I was a commercial breeder. because I was a hobby breeder. because I was a pet owner. Wayne Pacelle directs HSUS now and he supports the notion that all domestic animals should be extinct. He has said, "We have no ethical obligation to preserve the different breeds of livestock produced through selective breeding ...One generation and out. We have no problems with the extinction of domestic animals. They are creations of human selective breeding." Ingrid Newkirk of PeTA supports the notion that all domestic animals should be free and people should not own them. for they do so with the approval of their own conscience." But the tender mercies of the wicked are cruel". THESE are the times that try men's souls. The summer soldier and the sunshine patriot will, in this crisis, shrink from the service of thanks of man and woman. The destruction in Haiti is so awful, so massive it goes beyond belief. Then, to my total disgust, came a call from Pacelle and the Humane Society of the U.S. (HSUS) for DONATIONS for when they might possibly get there in the future "for the animals" <gagging>. THIS is after their theft of donations during Katrina. THIS is after they begged for donations for the care of Vick's dogs which they never had and then said to kill the dogs. THIS is after they told Animal Control, after a dog fighting bust, to KILL all the dogs including 5 week old puppies. THIS is after they prostituted Vick for more donations. Not only is the timing beyond belief, what kind of fools do they think.... well, forget that. They'll get donations. UGH! I thought I had become inured to the chutzpah, pure effrontery of Pacelle and the HSUS, but this is beyond the pale. Please everybody, do NOT donate to that sickening group. Do not give Pacelle more to give to your local legislators. I gave to responsible people who are helping the humans in Haiti, to those who are digging out the injured, feeding the hungry. Pacelle and HSUS make me totally sick to my stomach.